﻿﻿Buzz Bee is known for its cheap and unusual foam dart blasters. Their cheapest one, the Blow Blaster, can be stealthy and pack a small punch. Is it worth it? Find out below. On an adventure to find the Vortex blasters today, I saw at a Target the new Dart Tag darts in a 16 dart refill pack for $5. These are apparently really great darts and so I would get some. Happy Nerfing! The Reflex IX-1 is a very small but powerful pistol. Ever wish you could make it feel beefier and more powerful. Here's how: Normally, I load my Reflex like this. Instead of pushing the cocking mechinishem back and then forward, just pull it back and let it sit there. Then pull the trigger and you'll feel a slight jolt. There's your recoil. Happy Nerfing! 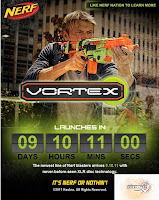 I've been searching around the Internet for the new Vortex blasters and found them for preorder on Amazon.com. It took me a while to find them because they do not come up with a "Nerf Vortex" search. The Nitron has some reviews on it also. All blasters will have free shipping if you order $25 worth and will be released on September 1st. (My first day of school!) 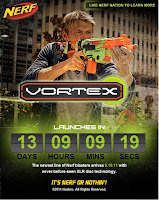 If you don't know what the Vortex blasters are, check out Nerf.com's Vortex Site or this post. As the Gear Up/Vortex codes for nerfvortex.com are starting to get posted around the Internet, I thought I'd make a nice catalog of codes for others to use. I'm sure that there are more codes out there, but this is a start If you want to see exclusive Vortex videos, pics, and info, these are the codes. If you have a code you want to share, tell me in the comments below. Have fun! ﻿Update: After doing more research, it seems that all the Gear Up codes are the same for each blaster. Plus, I tried telling people about my list of Vortex codes, but they flaged it as spam. I just want to help people! Have a good "Pre-Friday Eve." As soon as I can find the Proton, I'll buy it and a refill pack, too. What Vortex blaster do you want? Tell me in the comments. Let's find those guns! ﻿﻿Nerf N-Strike Barricade RV-10 is a relatively new blaster, as it came out last year. The fastest firing Nerf blaster combines speed and accuracy with ease. Get your Barricade RV-10 today! Also, target.com has the pictures, but no descriptions or prices, of the Vortex blasters. 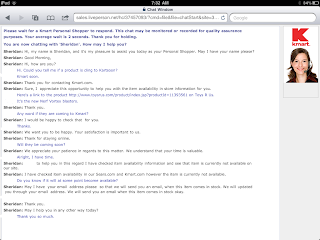 As of today, K-Mart has no Vortex info on their site. Watch here for more Nerf News. If you have found blasters at a local store of yours or have any opinions on the Vortex blasters, tell me in the comments. Hope you had a great Monday!